JNN 08 Aug 2015 Mogadishu : Takfiri al-Shabab Terrorists have overrun another town in central Somalia following the departure of the forces of the African Union Mission in Somalia (AMISOM) from the area. “We have taken Buqda town peacefully today. 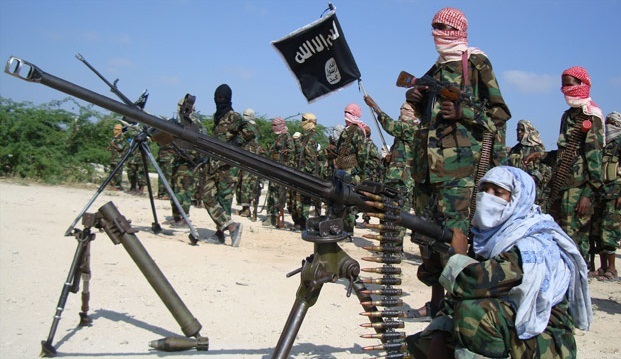 The town is now under our control,” Sheikh Abdiasis Abu Musab, a spokesman for the Terrorist group, said on Sunday. AMISOM forces, who had seized the control of Buqda from the Terrorist forces less than a month ago, left the town on Saturday night. Ahmed Nur, a top Somali army official, said military forces had left the town to counter al-Shabab elsewhere, adding that they will return. This is the third town that falls into the hands of the Wahabi Takfiris since Friday. The Terrorists captured the towns of El Saliindi, 65 km (40 miles) south of the capital, Mogadishu, and Kuntuwarey, on the road between the capital and the port of Barawe, both in the Lower Shabelle region, over the past three days. The Terrorist group, which is seeking to topple the Somali government, carries out regular attacks on government officials and the AMISOM peacekeeping force in the country. Somalia has been the scene of deadly clashes between military forces and al-Shabab Terrorists since 2006. In 2011, the Terrorists were pushed out of Mogadishu and other major cities in Somalia by government forces and the AMISOM, which is mainly made up of troops from Uganda, Ethiopia, Burundi, Djibouti, Kenya and Sierra Leone. This entry was posted in AFRICA and tagged al-Shabab, AMISOM, Mogadishu, Sheikh Abdiasis Abu Musab, Somalia, Terrorists, Wahabi Terrorists. Bookmark the permalink.